This first truly international history of the Korean War argues that by its timing, its course, and its outcome it functioned as a substitute for World War III. Stueck draws on recently available materials from seven countries, plus the archives of the United Nations, presenting a detailed narrative of the diplomacy of the conflict and a broad assessment of its critical role in the Cold War. He emphasizes the contribution of the United Nations, which at several key points in the conflict provided an important institutional framework within which less powerful nations were able to restrain the aggressive tendencies of the United States.In Stuecks view, contributors to the U.N. cause in Korea provided support not out of any abstract commitment to a universal system of collective security but because they saw an opportunity to influence U.S. policy. Chinese intervention in Korea in the fall of 1950 brought with it the threat of world war, but at that time and in other instances prior to the armistice in July 1953, Americas NATO allies and Third World neutrals succeeded in curbing American adventurism. 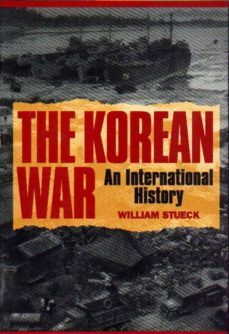 While conceding the tragic and brutal nature of the war, Stueck suggests that it helped to prevent the occurrence of an even more destructive conflict in Europe.